We are survivors. Breakout for Team Competition has begun. There was music throughout camp. Campers thought they were preparing for Aunt Emma’s Auction, but no. Everyone knew right away it was time for Breakout 2013. The Campers ran to the basketball court and watched the Peakers start their march up the road gathering more Peakers along the way to the beach. The Peakers danced on the beach surrounded by the other excited campers. Then, the Peakers met with each group and announced the Blue and White teams. 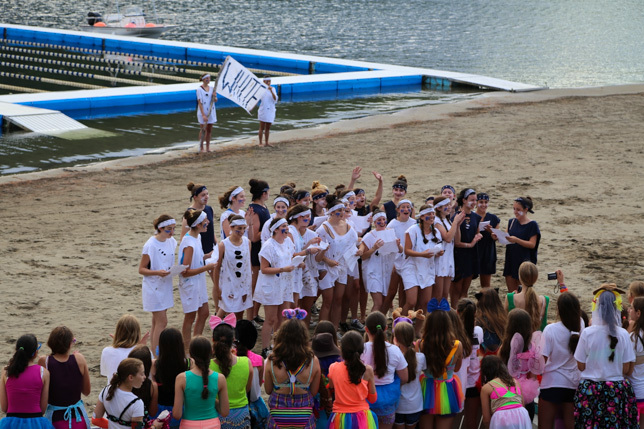 Quick team meetings introduced each camper to their team, and the first cheers of team competition filled camp. This will be a terrific summer of Team Competition. Lots of photos are up when you log in to our website.